Wearing a denim top (SHOPBOP.com) with a short A-Line skirt (Topshop) that I wore with tights because that is just simply a MUST in the Fall time! 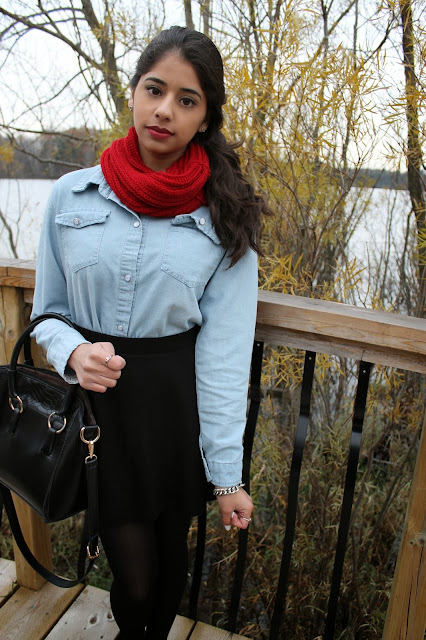 I love my cute little oxfords and snug-fit circle scarf that add a little sass to this outfit! You look lovely! Love the snood and the shoes! Great look! Adore the skirt! Loving this Fall layered look! You look gorgeous girl!